Joe Pulizzi - "All companies, no matter what the size, must start to think more like publishers than ever before. Consumer behavior has changed drastically over the past few years. Customers are more accepting of content from “non-media” sites and the barriers to publishing are now non-existent. " Job ads seeking someone to perform content strategy for a Web content development project are specifically written for those already in the Web development world. So they are full of jargon and industry speak, and sound very intimidating to the average reader. In reality, most of the requirements are easier to perform that they sound. Lets' look at some content strategist job requirements from ads that are currently live on the Web and I'll try to explain what they mean in plain English. "Work closely with merchandising, product information and marketing departments to help create taxonomies and metadata frameworks for grouping and tagging content"
"Help establish general taxonomy guidelines and assist in the development of new taxonomy structures and controlled vocabularies as needed." "Creating taxonomies and metadata frameworks for grouping and tagging content"
We need your help figuring out what to call things, and groups of things, on our Web site. When you have lots of products and product categories, you have to give the site user a way to logically navigate to the exact product they are seeking. You wouldn't want to send a user to a page with 1000 product names on it with links, they would never find anything and leave. So you have to create groups and sub groups with logical names that the reader would understand all leading him to a single product. There are a lot of decisions that have to be made along the way to creating these product hierarchies (taxonomies). In this case, a question might be - Do we want to use the name 'Work Boots' or 'Construction Boots'? Once you understand what is being asked, its not as complicated as it sounds. In looking through the latest online job postings, I saw very few entry-level content strategy jobs that could not be performed by a good tech writer, or other writing professional, who has an interest in technology and a little bit of training in the basics of content strategy. As a content strategist I'm not ashamed to admit that I have a lot of information architect friends. A lot. There, it's out there. Now everyone knows. So when we are talking about what they do on a project vs. what I do on a project, we tend to run into a lot of potential overlap. I often hear, "I don't see why a good IA couldn't do that." And I agree, but why the heck would you want one to? It's just not a good way to run a business. IAs are too busy already. In almost every project that I've worked, the IA was on the critical path. Giving them more to do would just extend the project duration. There are not enough IAs to go around in many organizations. In many organizations the number of projects they can take on is constrained by the number of IAs they have on staff, or that they can supervise as contractors. So it makes more sense to move your IA resources on and off projects as quickly as possible. Don't slow down the process with content work that could be done by others. Go do more projects. IAs are expensive. If a job can be done equally well by an IA or content strategist and the IA cost 30% more, you can increase the project's profit or decrease the project cost by using a content strategist. IAs generally don't want to do this kind of work anyway. Sure, there are more than a few IAs with literature or library science backgrounds, but they are designers at heart and by training. I don't know any IAs who wake up the morning looking forward to building new CMS inputs forms, or researching and writing content for 2000 product pages that are all built using the same wireframe. that I actually want to!" It's funny that not too long ago I was asked if I could produce wireframes for a content-only project. Hmmm. Maybe there are some IA tasks that a good content strategist could do. I'm just saying that I could, I'm not saying that I want to! Wink. Yesterday's post about Content Strategy and Neutral Spanish sparked some questions and conversation, so I'll go into a little more depth here. The idea of "neutral" or "standard" Spanish has been around for a while. In previous incarnations it was even considered a new lect, or language version, since it had some grammatical tense structure that was different than other versions of Spanish. Well, the Internet has changed that a bit. When used in the context of Web content the concept of neutral Spanish is really more of a translation process than it is a language variety. When translating content, a translator trying to create a neutral Spanish version will not only remove localized idioms and grammatical structures, but also try and "normalize" word usage. It becomes very important that these decisions are documented for words and phrases that are important on your Web site. Where possible, you need to set a standard and write it down in a translation glossary that can be used by anyone performing Web content translations. When is Neutral Spanish Needed? I've found two instances where using a neutral version of Spanish is helpful - when writing for the U.S. Spanish market, and when writing for all Spanish readers. The structure of your site will affect this choice. For the site I work on, the products and services offered vary greatly by country, so we have different content for each country and languages used for that country. This makes it easy for us to use Castillian Spanish in Spain and Mexican Spanish in Mexico. If you just translate your site by language and don't have a different version for each country, then neutral Spanish could be an option depending on your market. Also, neutral Spanish is ideal for content that is technical or scientific in nature. Do We Need Another Version of Spanish for the U.S. Market? One of the most complicated parts of developing a content strategy for a project at UPS is dealing with the translation impacts. Translations not only add to the cost of a project, but significantly impact the project plan and project complexity. When translating content into Spanish, we currently support four versions - Castillian Spanish (Spain), Puerto Rican Spanish, Mexican Spanish, South American Spanish. Whenever we talk about adding the ability for customers in the U.S. to view content in Spanish, the "which version" question comes up. The Spanish-speaking population in the U.S. is just as diverse as the English-speaking population, maybe more so. I've long argued for another version of Spanish for the U.S. market that is neutral to country of origin. Should Web content in the U.S. be translated using one of the existing varieties of Spanish, or do we need a new, neutral, version of Spanish to support a more diverse population? Here is an interesting article that supports the "neutral" argument. OK, I confess that I’ve not always been the cool Web guy (ha! ), I worked my way into a Web job as a technical writer. And not just any kind of tech writing, but seriously geeky stuff. 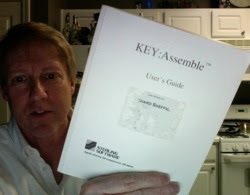 My first exposure to the Web involved converting a 900-page programmer user guide from print to HTML. It wasn’t even a popular programming language, but a language only used in what was known as CASE tools - great plan back in the 90’s to generate mainframe code by drawing diagrams. Anyway, not glamorous stuff. So I’ve always contented that tech writers make good Web Content Strategists. You are not usually writing about technical issues, but you have to function in a very technical environment. The biggest hurdle I see for most tech writers is getting past a mental block about writing “marketing stuff.” Marketing is not a dirty word, and if properly done, it can sell and inform at the same time. 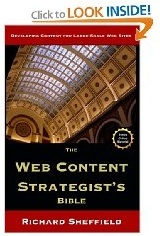 If you have a background in tech writing, and an interest in the Web, content strategy could be a great career move. I find the work much more interesting and Content Strategy certainly pays better. Here is an interesting, STC-related, article about Tech Writers and Content Strategists. I've often said that, like cooking a meal, one of the most complicated parts of content strategy is making everything come out at the same time. If you drain the pasta and the sauce is late, the pasta quickly turns into a big sticky blob. And if you start with bad ingredients, or have a lousy process, the finished product is going to be crap. Here is an excellent article that compares a good content strategist to chef Gordon Ramsay on the show Hell's Kitchen. While US Airways pilot Chesley Sullenberger was busy becoming a hero, the US Airways folks that run their Web site were left standing in a puddle of crap and they didn't have the shoes for it. Even hours after the crash, they still had no news at all up on the site. Now I'm sure they had an approved emergency communications plan for the site, but when the worst happened, it failed in epic fashion. Do you have a way of quickly communicating to your customers should the worst happen? Most of you probably do. Do you have content that is already written, approved and ready to go? Probably not, and that's what slows things down when a crisis comes. Everyone who needs to approve and sign off on this critical content is too busy handling the crisis to be bothered. If US Airways had just posted a quick notice acknowledging the crash, providing a contact phone number for families, and a promise to provide updates as quickly as possible, they could have avoided this black eye. And a template for that content could have been written and approved long before the crash so anyone could have filled in the blanks and posted the notice without waiting for approvals. Here is a detailed look at the US Airways Web response.